This August will be the 10th anniversary of the passing of Bob Moog, who has been such an inspiration to me and the reason I first found a passion for playing theremin! Expect lots of artwork and even * a theremin composition :) * posted here in the next few weeks! What will others be doing for the occasion? Any ideas? Here is an amazing interview with him! Well if people are interested, we could do a Festschrift-like thing here. A Festschrift is a compendium of scholarly articles honoring a well respected person in some field. Now this is normally an academic thing done for a living person (there is a similar thing called a Gedenkschrift that is dedicated to someone who has died) but we can take the general concept. People could either write a short posting on a subject that's related to Bob Moog, or perhaps tell a story about him if they knew him, or maybe tell a story about how he changed their life in some way (he did mine) or the composers out there might write an Homage piece to him. All could be placed in this or some other thread. Those are wonderful ideas! Anyone who has access to scholarly articles (I heard Cornell has his archives) is welcome to post about them. I am in fact preparing a story about how much he has changed my own life. I'm creating some drawings as well. Here's the Moog documentary in case anyone wants to view it, it's quite inspiring :) Moog Music has uploaded it to their YouTube channel and I embedded the videos below, I think they also sell DVDs. "Synthesizer pioneer and inventor BOB MOOG was probably the coolest nerd on the planet. Thanks to Mr.Moog, the deliverance of the synthesizer and its funny, quirky sounds, which is now heavily used in our music world, was created. 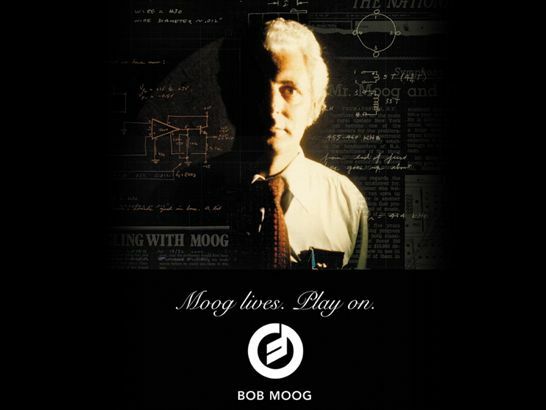 In remembrance of the late Bob Moog, Moog Music Inc has released a documentary excelling just over an hour’s worth of footage of Bob and the evolution of Moog instruments for what would have been the man’s 79th birthday. Not only is it extremely interesting, it’s simultaneously quite educational. His construction of the analog synth was something that took a little while to warm up to, as he contextually explains its strange initiation and acceptance due to the scepticism of electronic instruments, as they were seen as dangerous and phony in comparison to the wood, brass and string families and their traditional usage. He shows us the building of analog synths and how they operate differently from digital instruments. This is through his detailing of the connectivity of an analog board and its electrical circuit. To put this into practice, every scene welcomes us with the composition of a Moog instrument, and features live performance and discussion from artists such as Money Mark, Edd Kalehoff, DJ Logic, Keith Emersonand Stereolab. We also learn that New York first utilised Moog products in music houses for commercials at their first release, due to the huge price tags of the instruments. Aside from being a new, innovative product, this was primarily because of the amount of time and work that went into one single synthesizer, as they were all handmade instruments. If you want an idea of the value of an original Moog now, some dude is selling a vintage minimoog model for US $5495 on eBay.. 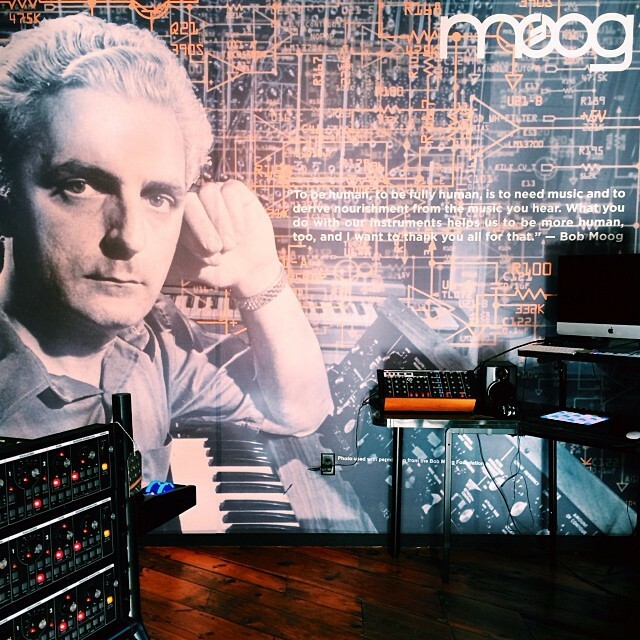 Throughout the doco, watch him travel, brushing heads with musicians, DJs and composers as they share Moog memories and discuss the craft of music. We learn about how the synthesizer got its name, the simplicity and elegance of the theremin (the first instrument he ever made for money back in 1954) and Moog instruments’ relevance to design and engineering as well as music and the importance of their evolution. One particular conversation in the doco is between Bob Moog and Rick Wakeman. After Wakeman explains his first minimoog purchase experience, he illustrates the impact Moog synths have made, as they “changed the face of music”. These relationships really highlight the importance of Moog‘s special existence. After a brief visit to Tokyo, the documentary wraps up with Bob Moog‘s philosophy of reality. He links this with the connectivity of an instrument that he’s built and how that piece of machinery beholds a memory of him. This talk of connection is apparent earlier in the film where he is strolling through his vegetable garden. It then closes with Moog completely in his element, as he plays his theremin in a leafy, green environment. This is how he’ll be remembered as his legacy will live on forever in what he’s given to music. Ever since learning about Bob Moog and his legacy I knew I wanted a Moog theremin, even if that meant waiting longer and paying more. I was also touched by the fact that "Moog Music synthesizers and effects are lovingly handcrafted at the Moog factory in downtown Asheville, N.C. Each instrument and effect is built to order by real people, just for you." (Moog Music website). 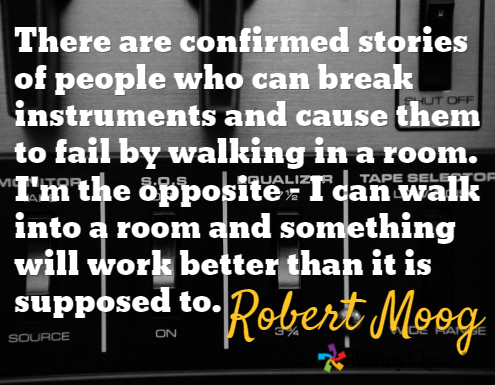 And then there's these sweet quotes from Bob Moog himself that he treats his theremins (and synthesizers?) as living and able to connect with people. I just love that. No doubt that a theremin made by the legacy and heart of Bob Moog will be special and sweet indeed! So as August 21st approaches, I have finally found my theremin, or my theremin found me :) The opportunity arose for me to "adopt" a used Moog Etherwave Plus which will find an excellent and caring home with me! I have already picked out a perfect name for her which I will announce at a later time! Which brings me to ask, how well do you think the new leadership of Moog Music is carrying on the spirit and legacy of Bob Moog? Today I'd like to share an amazing interview with Bob Moog! And I think I mentioned I'm making some tribute art of Bob Moog and Leon Theremin. I found some rare photos of them actually together, so it's not entirely fictional :) I wouldn't want to keep them to myself so I had to share! Is anyone else buying "Bach to Moog", Sony's album for the 10th anniversary of Bob Moog's passing - it's like an update to "Switched on Bach"? Bach to Moog combines real orchestra and solo players with electronics. What I heard on the Moog web site was not that impressive but I'll preview tracks on itunes and likely buy ones I like. Nothing approaches the original Switched on Bach album (and the companion Brandenburg Concertos album - which IMHO is even better). Wendy Carlos came out with another version years later and it was nothing as good - too much technology - broke my heart as Switched on Bach is what got me interested in classical music. The original was done at a time when there was little modern recording technology and I think the problems that had to be surmounted because of that actually helped create better music. Anyone who has not heard the Brandenburg Concertos album needs to. I think Buckley's Firing Line used Cto#2 as its theme song from the album. Bob Moog has said: "To be human, to be fully human, is to need music and to derive nourishment from the music you hear."